Hit the Ground Running: Mail Time! I'm so glad you wrote about SkirtSpots! I've been thinking about getting their Fearless Marathon Chick skirt but I wasn't sure about the quality for the price. How nice of your mom to send you the skirt, too! So thoughtful! Every single time I get the mail I hear the "here's the mail, it never fails" jingle in my head. Every. Single. Time. And I always want to do the hand wiggle too, but I usually refrain and just sing the little jingle in my head! I'm soo glad I'm not the only one who sings the Blue's Clues jingle in my head. Weren't we a little old to watch that when it first came out?! As for the skirt, I was between on sizes and went a size up because I hate when bottoms are too tight in the waist; it was the right decision as it fits wonderfully. Nothing makes me feel better than wearing a nice golf outfit, and I think I perform better when I wear one! Same thing for running, I am sure. Smiley mail? The first-night-of-Hanukkah tower of treats that my kiddies sent me--today! Yeay, stickers...can't wait to see them. Love the low-tech, clean look. I think looking good definitely impacts performance! How did the tower of snacks taste? Are there any left? I only put my stickers on the glass on my car. That way they're easier to remove and don't do any damage. I think you should put your sticker on! It deserves to be displayed! That skirt is super cute!!! I have considered getting one from SkirtSports but just couldn't commit to buying without knowing! This helps a lot!!! I made my kids watch Ferris Bueller a few months ago....the memories! Ferris Beuller is such a classic. Love it. I definitely recommend this particular skirt; I don't recall if their other styles have as many pockets! Happy Hanukkah! :) You look very cute in your running skirt. Love the decals, too! IT'S OFFICIAL, you ran a marathon because your car says so! I am smiling getting Christmas cards in the mail this week! It's super weird, but advertising 26.2 on my car really DOES make it feel more official! Holiday cards are the best! Someday Matt and I will remember to actually send them out. The other day I unexpectedly received a GIANT amazon box. It is a Christmas gift from a friend, so we can't open it, but it's driving me crazy! I think it still makes me smile every time I walk into the living room. Ooh I love getting surprise packages in the mail, especially from Amazon, because it could be ANYTHING! I cannot get into running skirts for some reason. But, I hardly run in shorts, so that may be part of the problem. You look rockin' in yours though! LOVE the stickers. The runners in my life have been giving me a hard time for me. "You've got to get rid of that 13.1 crap!" Mostly, they just want me to run a marathon. See, I NEVER run in capris. They're just too restrictive and hot for me. I like my legs to feel totally free hehe. 13.1 is never crap! I'd be offended ;o) But yes, they probably just want you to do a full. I think running is becoming so easy for you, a full would be no problem! Happy Hanukkah - those latkes look great. I've never run with a skirt before - looks cute. I like that your decals are round vs. the oval shape you usually see. Yeah, I definitely prefer the round look. The ovals just don't suit my style. Agreed - the sticker makes it official! Your skirt is cute and it's great that it's functional. 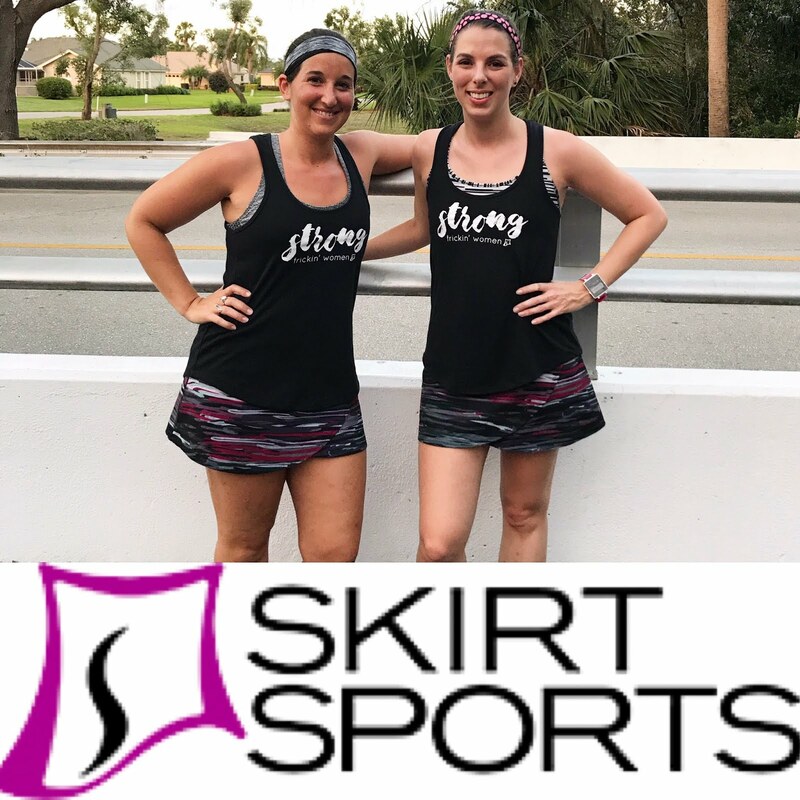 I've never worn a running skirt before but they seem to be becoming more and more popular. Yeah, they're definitely becoming more popular. I used to be skeptical of them but now I really love them. I love getting mail, especially running-related mail! :) The skirt is adorable and the stickers look so grown up and sleek! Getting mail that's not bills or junk is the best!